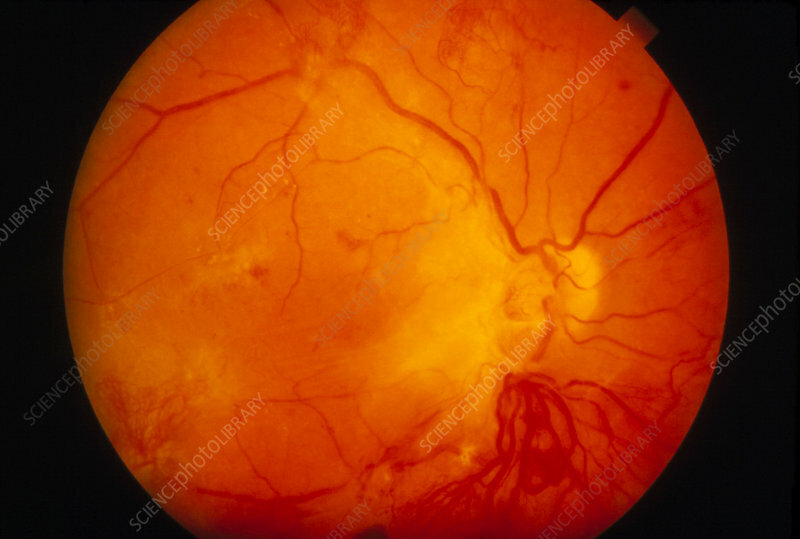 Diabetic retinopathy: fundus camera image showing retinal changes in proliferative diabetic retinopathy. Diabetic retinopathy is the most common cause of preventable blindness in Western society. Its cause is obscure, although adult non- insulin dependent patients are more susceptible. Early (background) changes, may progress to a proliferative stage, with the formation of new blood vessels - neovascularization - (top of image) & visual loss from vitreous haemorrhage, retinal detachment & ischaemia (restricted blood flow). Neovascularization around the optic disc (bottom right) indicates a poor prognosis.